Do you know your sh!t? That’s the bold question the development charity WaterAid is asking as it launches an interactive quiz to test your knowledge of all things faecal, from the correct way to hang your loo roll (according to the 1891 patent) to the amount of faeces you would accidentally eat in a year if you lived in a town without flushing toilets, clean water or sewers (a jar of chocolate spread or a chocolate coin?). The serious message behind the fun quiz is that although in the UK we might take our lavatories for granted, around the world 2.5 billion people still do not have access to safe, private toilets. The charity hopes the campaign will get people talking about sanitation. Everyone who takes the quiz is invited to sign WaterAid’s Make It Happen petition, which calls on the government to support the introduction of a dedicated sustainable development goal on water and sanitation at the United Nations General Assembly this September. The quiz was launched on Wednesday with the aim of collecting 100,000 petition signatures by early July. It is hoped the petition will be presented to politicians before the United Nations General Assembly in September, at which a new set of international development goals will be decided for the next 15 years. This year also marks the 150th anniversary of the UK's first modern sewer system, which transformed our cities and helped eliminate diseases such as cholera. How is the campaign being promoted? The quiz is being promoted on WaterAid’s social media channels, by email to supporters and on its website. The charity will also be running a paid-for Facebook campaign to reach new target audiences. It hopes to achieve mass engagement through social sharing – with people inviting friends to take the quiz – and will capture signatures for the petition. 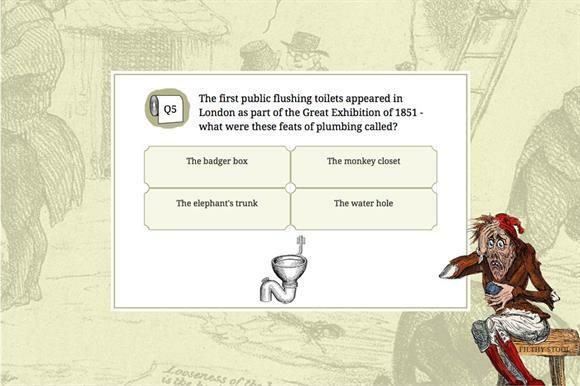 Alicia Robinson, digital communications lead at WaterAid, says: "Our Incredible Quiz isn't just quirky; it also throws up some surprising – not to mention deeply disgusting – facts about life in the UK not that long ago. However well you know your sh!t, you can't help but be shocked to think people around the world are still forced to live in conditions similar to our not-so-distant ancestors. While the quiz is a bit of fun, the call on politicians at the end to make sh!t happen so that no one has to live without clean water or a safe toilet is really important." The campaign is worthwhile and WaterAid has hit on a great way to educate people about the issue of sanitation and capture personal contact details, while throwing in some little-known facts and giving us a giggle. The quiz is provocative in nature and should appeal to social media users, both to complete and then share their results and the quiz with others. People will find themselves signing the attached petition with a guilty smirk on their faces as they childishly snigger about monkey closets and poo.